Last weekend I was at Project Zero in Sydney and Carrie James gave an inspirational opening plenary session entitled, Good Online Participation: Skills and Dispositions for a Globally Interconnected World. Carrie started by asking, what does good online participation look like and what does it require in a world that is getting smaller? Internet connectivity raises questions about how to engage in complex worlds. To demonstrate how the world is getting smaller, Carrie narrated a personal story about how children who play Minecraft screencast themselves and then host their video on their YouTube channel. Carrie referred to this as ‘media ecology‘- playing an online game and then sharing with a learning community. Young people are already active consumers, users and producers. Carrie’s example of how young people use Minecraft was a lightbulb moment for me in understanding how my Year 11 EAL Chinese students see their online engagement and identity. As part of the Walk My World project, my students created a video in response to the event Where I’ve Been. Using the poem Where I’m From by George Ella Lyon as a model, students wrote a blog and created an iMovie. In class, we discussed how to make an iMovie as this was new to my international students and the importance of using our own images and to select images that were copyright free. So when I watched the video below I wondered where the images were from and this led to a conversation about the student’s engagement in the JX online game and how she saw the images as hers due to her participation in the online community. I was left feeling puzzled as I have no experience in online games. It was not until Carrie’s session that I gained an understanding of how this demonstrates the ways in which our students are already participating, sharing and creating in online communities. In watching this student’s video I learnt much about her, how she participates online in a globally interconnected world. … make social media rich and socially meaningful. Opening Plenary Session; Carrie James, Good Online Participation: Skills and Dispositions for a globally Interconnected World. 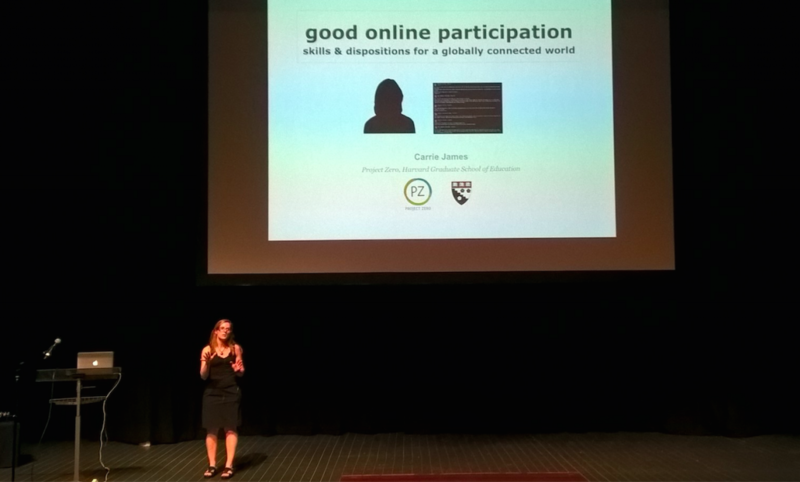 Carrie James presented on what good online digital participation looks like. She spoke about how youth express their civic voices online and how we can leverage social media in ways that promote good intercultural exchanges. The Out of Eden Learn Dialogue Toolkit is a wonderful resource for good digital participation and it was interesting to hear Carrie refer to #blacklivesmatter, #letthemstay, and this great 4th grade Lorax activism video. 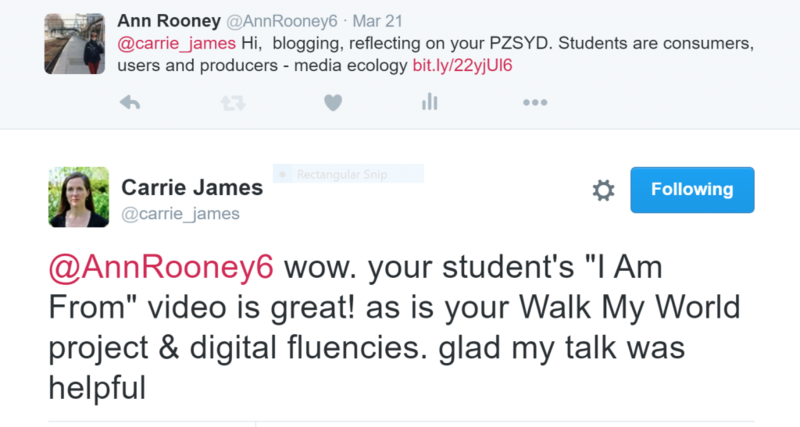 Tagged Carrie James, good online participation, media ecology, online games, Project Zero, PZSYD. Bookmark the permalink. I guess online participation know-how will soon become an essential skill for engaging effectively in the modern classroom. Such a learning environment with all it’s possibilities was unimaginable a few years ago.